Sift flour and baking powder together in a large bowl. Add sugar in the flour. Pour warm milk in the flour gradually. Knead the dough until it becomes as soft as ear lobes. 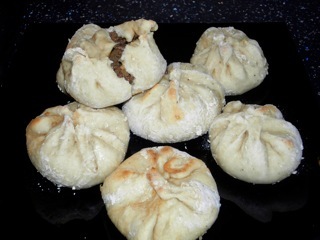 Divide the dough into 8 balls. Set aside. Chop onion and boiled bamboo shoot. Put ground pork, onion, bamboo shoot in a large bowl. Add ginger juice, soy sauce, oyster sauce, sugar, and sesame oil in the bowl. Mix well until the meat becomes sticky. Take a ball of dough and flatten by hands. 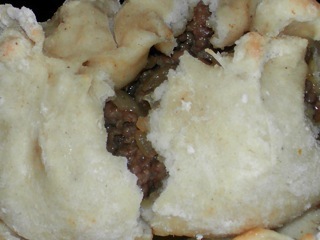 Put a spoonful of meat filling in the center of the dough and wrap it by gathering the dough to the top. Repeat the process to make more manju. Put each manju on a small square sheet of cooking paper. Preheat a steamer on high heat until starts steaming. 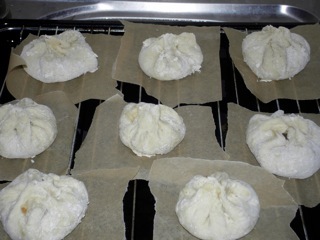 Place manju in the steamer. Steam about 15 minutes on high heat. "diferente" -eu nu am pus carne de pork,ci de vita,si nici bamboo,si am pus cam 3 linguri de ulei de susan. si nici zaharul,atit in aluat cit si in compozitie.